You say potatoes, we say Albert Bartlett. There’s always a place on the table for potatoes, whether they’re part of a hearty breakfast, weeknight family dinner, or holiday celebration. For years, Albert Bartlett has been a leader in the potato market in the United Kingdom. Now, consumers in the U.S. can enjoy the same great-tasting, versatile potatoes, because we’re the exclusive provider of premium Albert Bartlett potatoes in North America. Albert Bartlett potatoes are offered in exclusive varieties and also available under private label—all grown, stored, packaged, and delivered with a quality-first mindset. One taste and it’s easy to see that other potatoes just don’t mash up. There’s only one way to describe these perfectly bite-sized, perfectly convenient, perfectly delicious creamer potatoes. 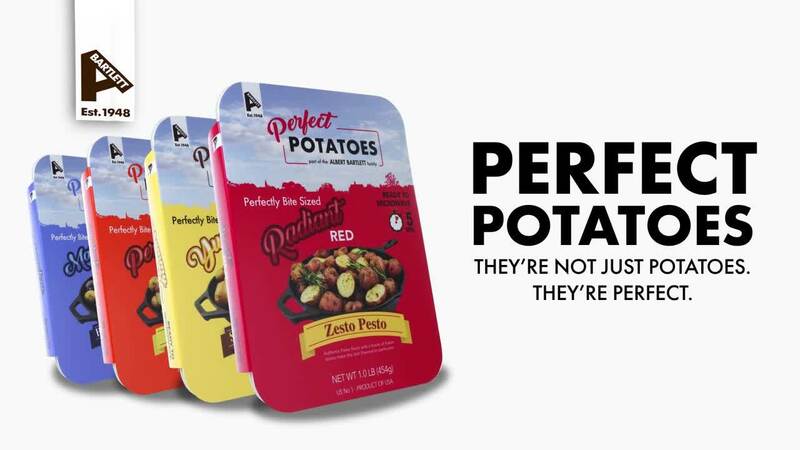 Brought to you exclusively by Robinson Fresh, Albert Bartlett Perfect Potatoes™ are grown in California, triple washed and dried, ready to heat and eat—no prep work, no guesswork. Just perfectly cooked potatoes with the bold, mouth-watering flavors that your shoppers will love. With their nutty flavor and buttery texture, Albert Bartlett Rooster potatoes do more. Try our Caprese Stuffed Rooster Potatoes—an easy, delicious recipe that can enhance any meal. The Albert Bartlett brand is used under license.